For a drug to be successful it must satisfy the pharmacokinetic and pharmacodynamic requirements. Pharmacokinetic requirements are that it must be absorbed, distributed, metabolised, excreted sufficiently and non-toxic. Pharmacodynamic requirements are that the drug must have sufficient efficacy (ability to carry out the desired effect) and selectivity. A synthetic drug coated with co-polymers. Scanning electron micrograph. When a drug enters the body there are certain biological barriers that the drug molecule must first pass to get to its target organ. For example, when a drug is taken orally it must pass barriers in the stomach, the small intestine, the blood and the liver before it reaches the target organ. Barriers which must be overcome in these regions are cell membranes, metabolic enzymes, efflux transporters and binding proteins. Needless to say, there are many criteria which a drug must possess in order to reach its target region. About 70% of drugs today are taken orally. Most pharmaceutical companies aim to develop an oral dosage form of their drug with a dosing regimen of once per day. Drugs of this type have reasonable manufacturing and storage costs and high patience compliance. Drug delivery for drugs administered orally usually involves encapsulating the drug using polymers. 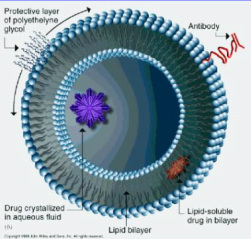 Liposomes are the main drug delivery system used today in oral administration. Drugs administered by parenteral routes (those which do not encounter the stomach or the GI tract) must also cross certain barriers. However, the basis of drug release from drug delivery systems is the same for all routes. Drug release is from: diffusion, degradation, swelling, and affinity-based mechanisms. Liposomes, polymeric micelles, nanoparticles, dendrimers and nanocrystals are a remaining portion of conventional drug delivery systems that happen to be on the nano-scale. Nanotechnology and its effects on drug delivery refers more correctly to the current drug delivery systems which include microchips, microneedle-based transdermal therapeutic systems, layer-by-layer assembled systems, and various microparticles produced by ink-jet technology. To appreciate the true meaning of nanotechnology in drug delivery, it may be beneficial to classify drug delivery systems based on the time period representing before and after the nanotechnology revolution. Varying permeability of the bilayer to different molecules. Ability to entrap both water soluble and insoluble substances and deliver them into desired environments. The size, lamellarity (unilamellar or multilamellar) and lipid composition of the bilayers influence many of the important properties like the fluidity, permeability, stability and structure -these can be controlled and customized to serve specific needs. The properties are also influenced by external parameters like the temperature, ionic strength and the presence of certain molecules nearby. A MicroArray Patch technology is being developed for the transdermal delivery of large molecule drugs, without the use of injections. The patch is in a band-aid format, and the surface of the patch is structured with polymer microneedles, from which the drug is delivered. The drugs can be attached to the external surface of the polymer microneedles, integrated into the polymer, or both. When the patch is applied, the microneedles cross the stratum corneum and penetrate into the epidermis. The microneedles do not penetrate deep enough to enter blood capillaries or nerves, hence the delivery is non-invasive and pain-free. The drugs for delivery are present in a nanostructured form, facilitating uptake into the body. The microneedles are made of a polymer that is biocompatible and biodegradable. This reduces the risk of trauma to the skin and infection. The MicroArray Patches have been designed for the delivery of peptides, proteins, hormones, vaccines and skin repair agents. The use of MicroArray Patches will enable a wide range of medications to be effectively delivered to humans in a safe and non-invasive manner. In the short clip on the right we see particles which measure 6micrometers in length passing through membranes half their width. They mimic red blood cells shape and consistency in that they are flexible and fold-able. Basically in this experiment it was proven that the more flexible the molecules are the longer they last in the circulatory system. It was also seen that molecules with different flexibility ended up in different organs. This may prove to be a very beneficial advancement in drug delivery. De Simone, the chemist who worked on this says with regards to these findings that hopefully 'applications for the delivery of cancer drugs could be in early clinical trial stages within four years.' UNC ChapelHill. Building on their previous work delivering cancer drugs with nanoparticles, MIT and Harvard researchers have turned their attention to cardiovascular disease, designing new particles that can cling to damaged artery walls and slowly release medicine. The particles, dubbed “nanoburrs,” are coated with tiny protein fragments that allow them to stick to damaged arterial walls. Once stuck, they can release drugs such as paclitaxel (taxol), which inhibits cell division and helps prevent growth of scar tissue that can clog arteries. About 15 years ago, MIT professors Robert Langer and Michael Cima had the idea to develop a programmable, wirelessly controlled microchip that would deliver drugs after implantation in a patient’s body. The MIT researchers and scientists from MicroCHIPS Inc.reported that they have successfully used such a chip to administer daily doses of an osteoporosis drug normally given by injection. The results, published in the Feb. 16 online edition of Science Translational Medicine, represent the first successful test of such a device and could help usher in a new era of telemedicine — delivering health care over a distance, Langer says. AUSTIN, Texas — A new form of proteins discovered by researchers at The University of Texas at Austin could drastically improve treatments for cancer and other diseases, as well as overcome some of the largest challenges in therapeutics: delivering drugs to patients safely, easily and more effectively. Aim? To deliver the proteins in high concentration intravenously by self injection like insulin. Problem? Delivering proteins in high concentrations as they tend to form aggregates that can be dangerous to patients and impossible to inject. Solution? The Cockrell School research team has introduced a new physical form of proteins, whereby proteins are packed into highly concentrated, nanometer-sized clusters that can pass through a needle into a patient to treat disease. The novel composition avoids the pitfalls of previous attempts because drug proteins are clustered so densely that they don’t unfold or form dangerous aggregates.